To control how the system interacts with the external (USB) storage devices, Windows defines two main policies: Better performance and Quick removal. The Better performance policy manages storage operations in a manner that improves the system performance. When this policy is turned ON, Windows can cache write operations to the external device to protect the integrity of data on those devices. 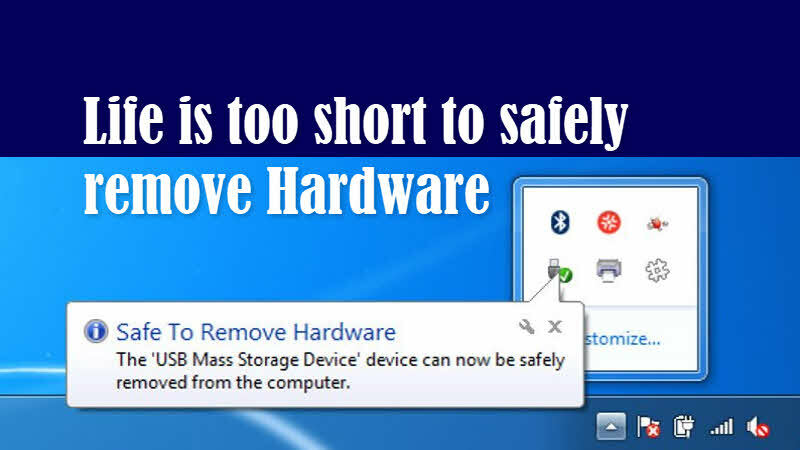 While performance is being considered, you must use the Safely Remove Hardware process to remove the external drive. When the Quick removal policy is enabled, you can remove the device without using the Safely Remove Hardware process. It became possible because this policy manages storage operations in a manner that keeps the device ready to remove at any time. In earlier versions of Windows the default policy was Better performance. But with Windows 10 version 1809, which was released globally in December 2018, the default state for all USB storage devices become Quick removal. As the operating system won't cache disk write operations, you may see a performance degrade while copying file to/from the storage device. Though the default policy has been changed to allow you to quickly eject/disconnect your USB media, but there is still an option that will allow you to overwrite the default Quick removal policy option. In case you select the Better performance option, Microsoft recommends that you should also select the Enable write caching on the device. You can check the Microsoft support page documentation to see which options you need to modify in the Disk Management settings page to take advantage of those caching policies. If you have come this far, it means that you liked what you are reading (Life is too short to safely remove hardware!!! ).